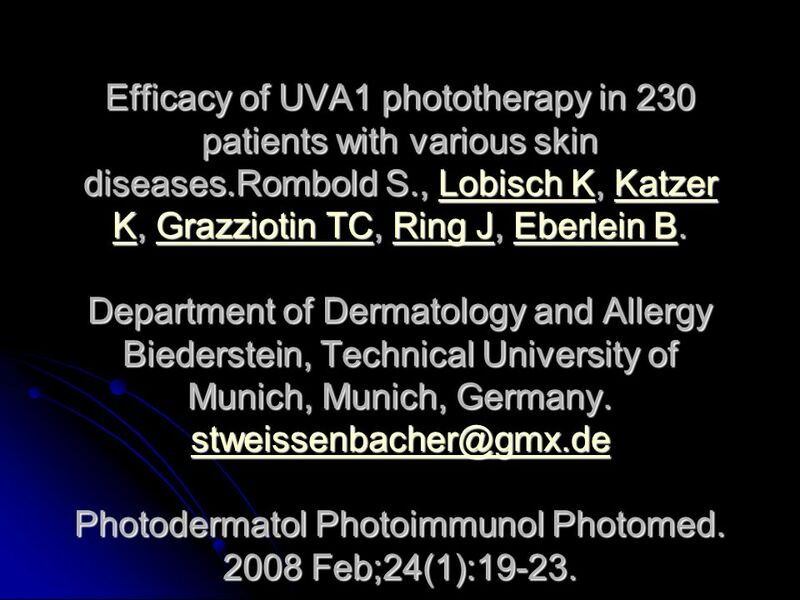 Efficacy of UVA1 phototherapy in 230 patients with various skin diseases.Rombold S., Lobisch K, Katzer K, Grazziotin TC, Ring J, Eberlein B. Department. 1 Efficacy of UVA1 phototherapy in 230 patients with various skin diseases.Rombold S., Lobisch K, Katzer K, Grazziotin TC, Ring J, Eberlein B. Department of Dermatology and Allergy Biederstein, Technical University of Munich, Munich, Germany. Photodermatol Photoimmunol Photomed Feb;24(1):19-23. 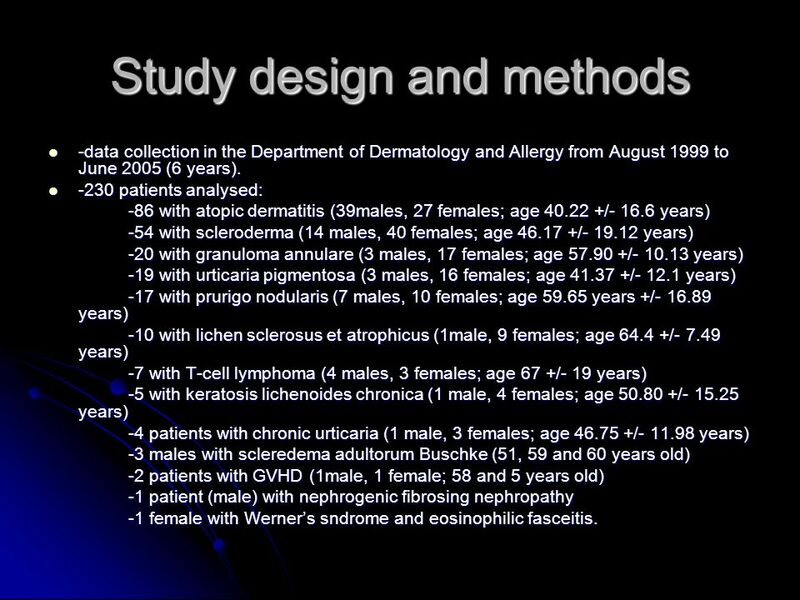 -data collection in the Department of Dermatology and Allergy from August 1999 to June 2005 (6 years). 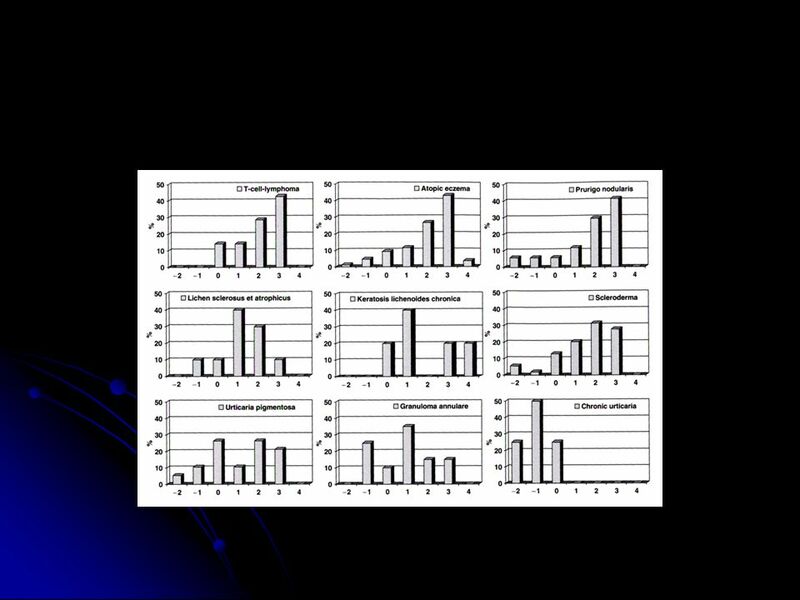 -230 patients analysed: -86 with atopic dermatitis (39males, 27 females; age / years) -54 with scleroderma (14 males, 40 females; age / years) -20 with granuloma annulare (3 males, 17 females; age / years) -19 with urticaria pigmentosa (3 males, 16 females; age / years) -17 with prurigo nodularis (7 males, 10 females; age years +/ years) -10 with lichen sclerosus et atrophicus (1male, 9 females; age / years) -7 with T-cell lymphoma (4 males, 3 females; age 67 +/- 19 years) -5 with keratosis lichenoides chronica (1 male, 4 females; age / years) -4 patients with chronic urticaria (1 male, 3 females; age / years) -3 males with scleredema adultorum Buschke (51, 59 and 60 years old) -2 patients with GVHD (1male, 1 female; 58 and 5 years old) -1 patient (male) with nephrogenic fibrosing nephropathy -1 female with Werner’s sndrome and eosinophilic fasceitis. 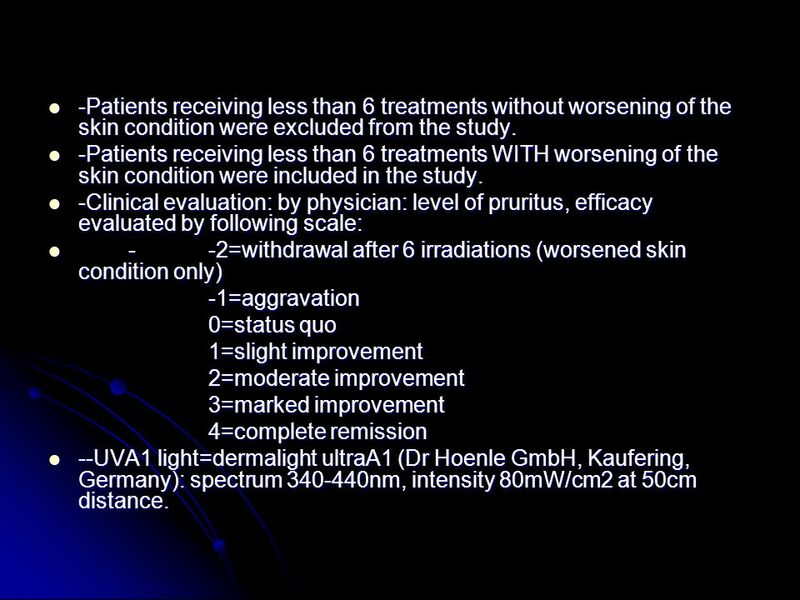 5 -Patients receiving less than 6 treatments without worsening of the skin condition were excluded from the study. -Patients receiving less than 6 treatments WITH worsening of the skin condition were included in the study. -Clinical evaluation: by physician: level of pruritus, efficacy evaluated by following scale: -	-2=withdrawal after 6 irradiations (worsened skin condition only) -1=aggravation 0=status quo 1=slight improvement 2=moderate improvement 3=marked improvement 4=complete remission --UVA1 light=dermalight ultraA1 (Dr Hoenle GmbH, Kaufering, Germany): spectrum nm, intensity 80mW/cm2 at 50cm distance. 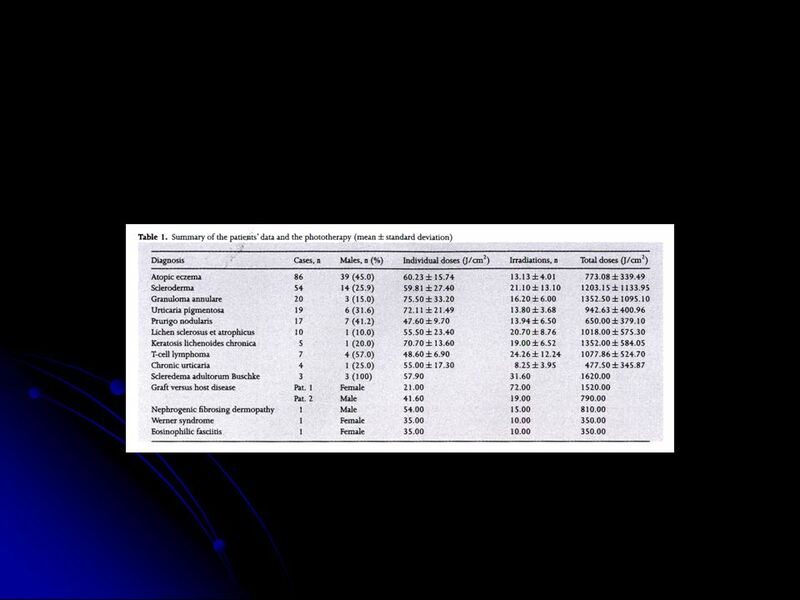 9 Discussion In earlier studies with UVA1 , patients were treated with higher doses comparing with earlier studies. This is why the mean single doses vary accordingly to groups which include patients treated earlier. Atopic eczema Medium-dose UVA1 therapy in patients with atopic eczema led to a moderate to marked improvement in most patients as already noted in earlier studies. 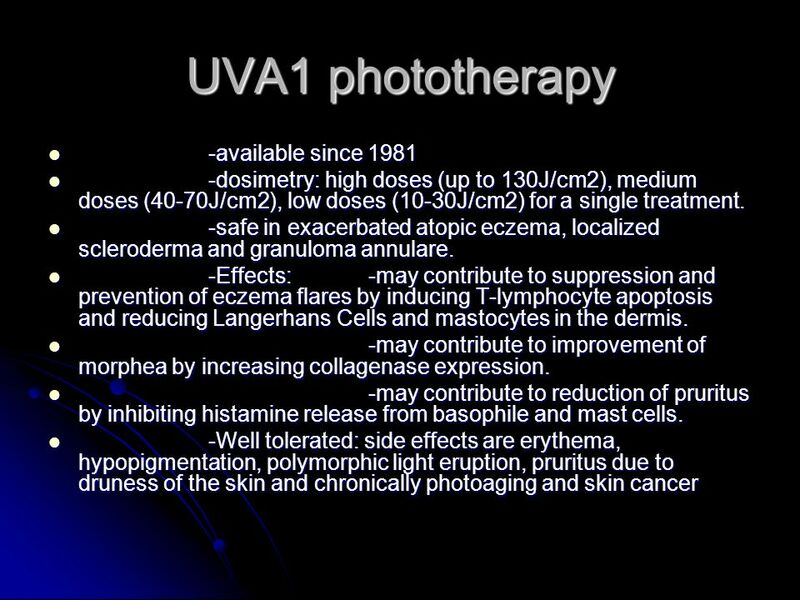 UVA1 has already been shown to be superiorly effective than UVA/UVB or PUVA therapy. High-dose UVA1 therapy has been shown to significantly improve clinically patients with severe atopic eczema. High-doses and Medium-dose UVA1 therapy have been shown to have a comparable effect. 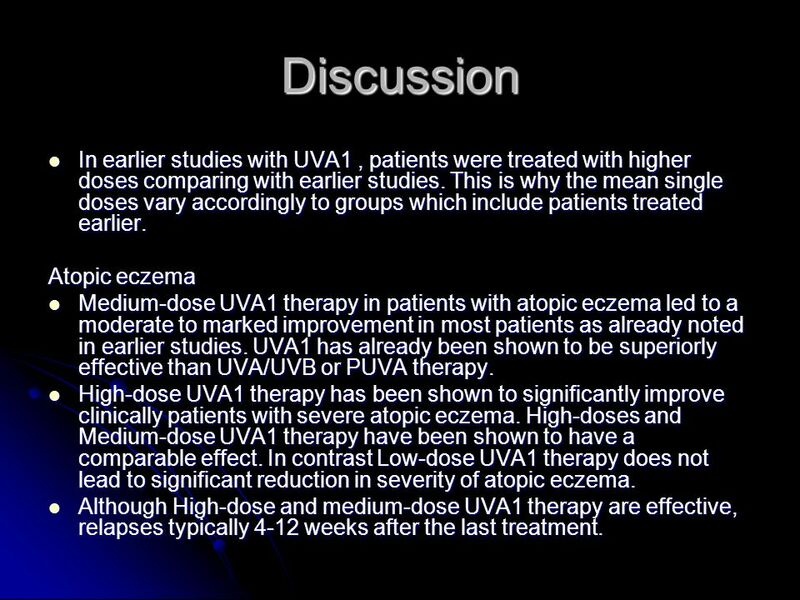 In contrast Low-dose UVA1 therapy does not lead to significant reduction in severity of atopic eczema. Although High-dose and medium-dose UVA1 therapy are effective, relapses typically 4-12 weeks after the last treatment. 10 Scleroderma Improved in the study. High dose decreases skin thickness ans stiffness. In other studies, low-dose and medium dose UVA1 are effective. It has also been shown that medium-dose UVA1 therapy in localized scleroderma is significantly more effective than narrow-band UVB treatment. Lichen sclerosus et atrophicus and keratosis lichenoides chronica Medium-dose UVA1 has been shown to be effective in most cases of these lesions. Even with low-dose UVA1, clinical score, skin thickness and increase in dermal density have been demonstrated in lichen sclerosus et atrophicus. PUVA is also effective. 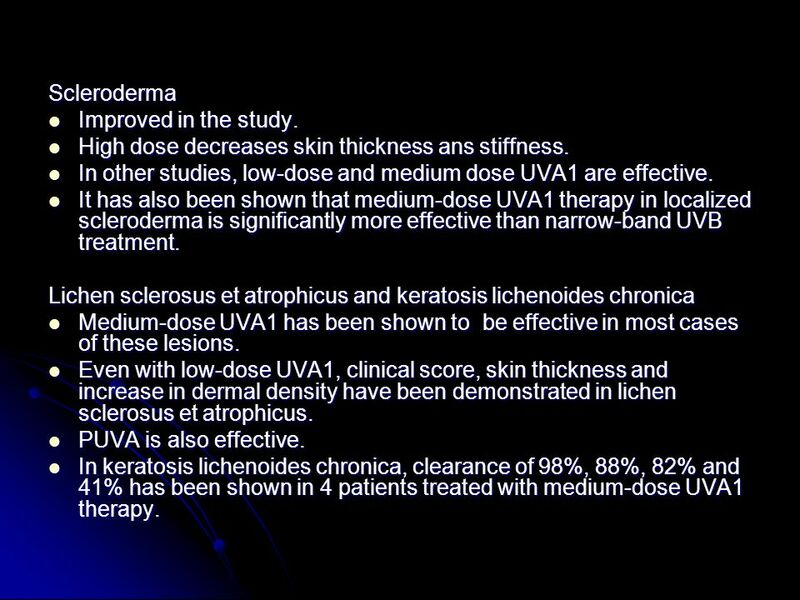 In keratosis lichenoides chronica, clearance of 98%, 88%, 82% and 41% has been shown in 4 patients treated with medium-dose UVA1 therapy. 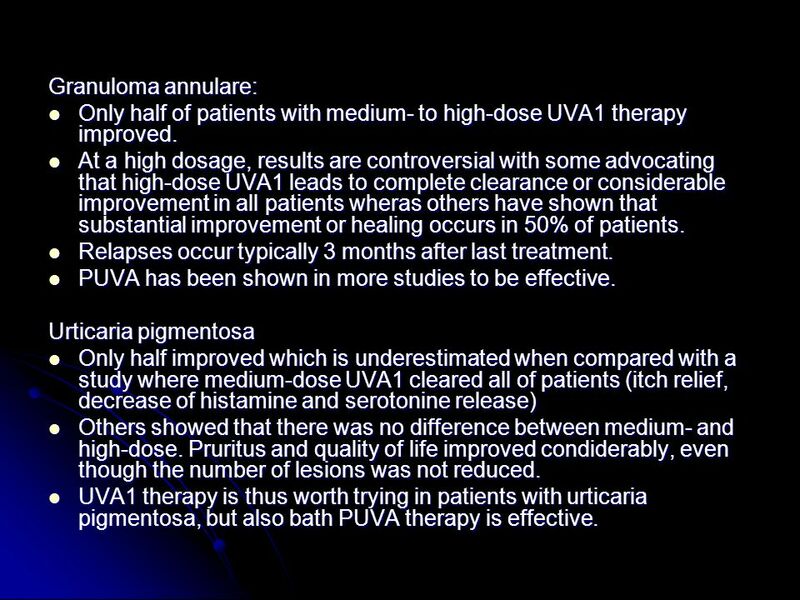 11 Granuloma annulare: Only half of patients with medium- to high-dose UVA1 therapy improved. At a high dosage, results are controversial with some advocating that high-dose UVA1 leads to complete clearance or considerable improvement in all patients wheras others have shown that substantial improvement or healing occurs in 50% of patients. Relapses occur typically 3 months after last treatment. PUVA has been shown in more studies to be effective. Urticaria pigmentosa Only half improved which is underestimated when compared with a study where medium-dose UVA1 cleared all of patients (itch relief, decrease of histamine and serotonine release) Others showed that there was no difference between medium- and high-dose. Pruritus and quality of life improved condiderably, even though the number of lesions was not reduced. UVA1 therapy is thus worth trying in patients with urticaria pigmentosa, but also bath PUVA therapy is effective. 12 Prurigo Nodularis Quite effective No studies published on UVA1 therapy and prurigo nodularis. Improvement has been shown in patients treated with NBUVB combined with thalidomide. 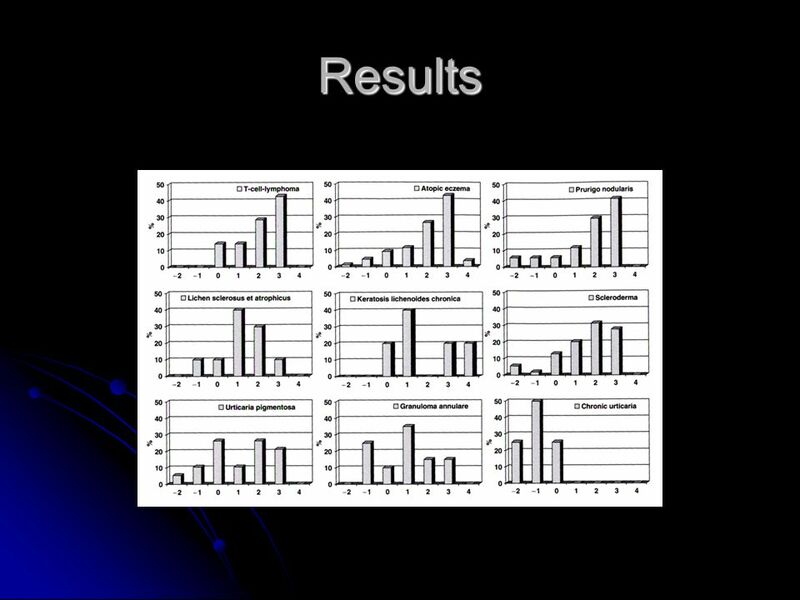 Chronic urticaria No effect Little data in the literature in UV light treatment. 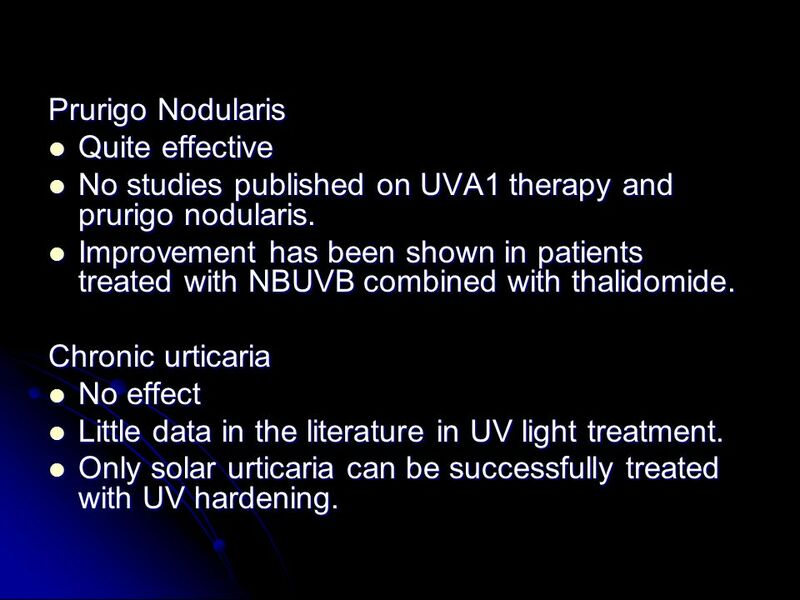 Only solar urticaria can be successfully treated with UV hardening. 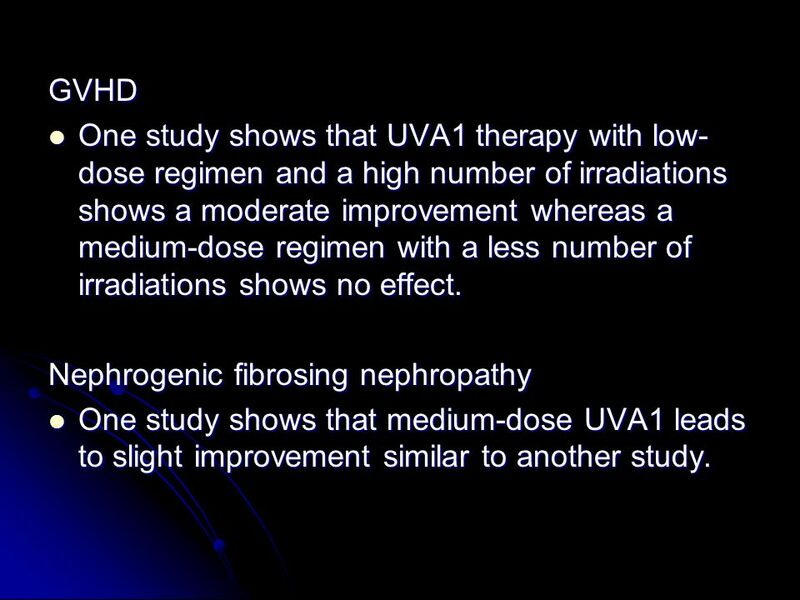 13 GVHD One study shows that UVA1 therapy with low-dose regimen and a high number of irradiations shows a moderate improvement whereas a medium-dose regimen with a less number of irradiations shows no effect. Nephrogenic fibrosing nephropathy One study shows that medium-dose UVA1 leads to slight improvement similar to another study. 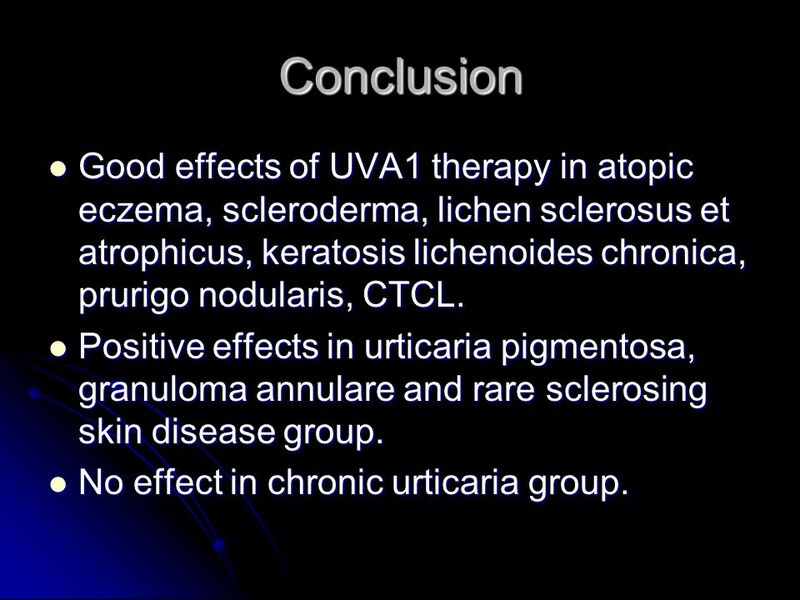 14 Conclusion Good effects of UVA1 therapy in atopic eczema, scleroderma, lichen sclerosus et atrophicus, keratosis lichenoides chronica, prurigo nodularis, CTCL. Positive effects in urticaria pigmentosa, granuloma annulare and rare sclerosing skin disease group. No effect in chronic urticaria group. 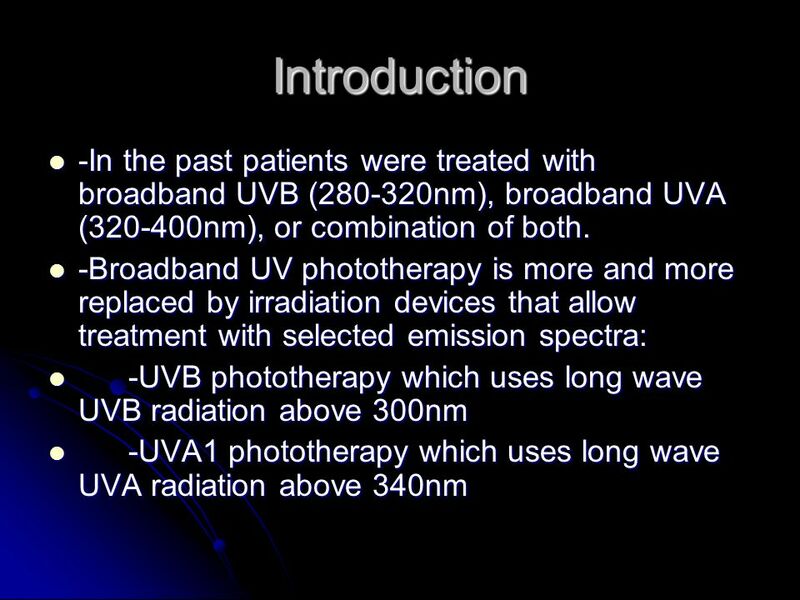 Download ppt "Efficacy of UVA1 phototherapy in 230 patients with various skin diseases.Rombold S., Lobisch K, Katzer K, Grazziotin TC, Ring J, Eberlein B. Department."